America’s multi-state super lottery created the second biggest jackpot win of all time: a massive $656m (£480m) in March 2012. It takes place every Wednesday and Saturday morning at approximately 4am GMT. You can bet on the outcome of this draw and win the same prizes at Lottoland. How does betting on the MegaMillions at Lottoland work? Instead of entering the official MegaMillions lottery draw, you place a bet on the outcome and the results of it can be found here. You pick the numbers you think will be drawn in the same way as if you had entered the official lottery draw. Betting with us, you win the amount that you would have won if the official prize fund was shared between you and any official lottery winners. Choose 5 numbers from the main pool of 1-70 and 1 further number, known as the ‘Megaball’, from a pool of 1-25 or select the QuickPick option (Quick+1). Once you have chosen your numbers, select which draw you want to bet on, either Wednesday or Saturday, and press ‘Submit’. This will take you through to a checkout – at this stage just click ‘Confirm and proceed’ to place your bet. You will win our jackpot if your 5 main numbers and 1 MegaBall is the same as those in the official MegaMillions draw. The MegaMillions jackpot is uncapped, creating the potential for huge payouts. You can also go for twice the MegaMillions jackpot by selecting the DoubleJackpot option. See below for information on how this feature works. The DoubleJackpot feature allows you to bet for twice the official lottery jackpot. So, for instance, if the official MegaMillions draw is £100m and you bet on the outcome with us and activate the DoubleJackpot feature, you will go for a jackpot of £200m. The prizes for all other tiers will remain the same. You will pay double the price of your normal line to activate the DoubleJackpot feature. The MegaMillions draw takes place every Tuesday and Friday night in Atlanta, Georgia USA at approximately 11pm, which equates to 4am on Wednesday and Saturday in the UK. The odds of winning the jackpot are 1 in 302,575,350. A breakdown of all the odds for each prize tier, together with estimated returns is included below. The MegaPlier feature allows you to boost the potential winnings on all non-jackpot prize tiers by either x2/x3/x4/x5. The MegaPlier number is drawn by a random number generator. Let’s say you win the second prize tier having selected the MegaPlier feature. If the normal payout is £680k you will win either x2, x3, x4 or x5 that amount depending on the number drawn out. It costs £1 to activate the MegaPlier feature. When you bet on the outcome of the MegaMillions, you win the amount that you would have won if the official prize fund was shared between you and any official lottery winners. The table below explains the different prize tiers, odds of winning each prize tier and the estimated individual returns for each prize tier. The information below is provided as a guide only. Should you win you will be paid out in pounds. The values shown are in pound sterling. Please bear in mind that the values shown are dependent on the euro to pound exchange rate. Lottoland replicate the pay-out structure of the Official Lottery Draws in America and for this reason the total prize is reduced by 38% to make allowances for the tax Official winners in Tiers 1 to 3 would have to pay. Lottoland may pay out the Winnings in Prize Category 1 over 30 years (the “Annuity Option”). The lump sum method will be paid out at 60% of the total value of the annuity amount. The annuity method will be paid as one annual payment being made for the 30 year term. The level of payments are calculated such that the payments rise 4% from year to year until the full sum has been paid out. Why should I bet on MegaMillions at Lottoland? At Lottoland we offer you the opportunity to go for the biggest jackpots the world has to offer and they don’t come any bigger than MegaMillions. This incredible draw grows without any limit and has created the biggest jackpots of all time. You can boost your potential winnings by selecting the attractive MegaPlier option. In addition to this a single bet costs from just £3. A syndicate, in the sense of betting on lotteries, is a group of people that combine their money in order to increase their chances of winning. With the money that they pool together, they make multiple line bets together on the outcome of a lottery draw and share any prize money won. The benefit of the Syndicate feature is that it lets you boost your chances of winning, allowing you to buy much more shares of numerous lottery line bets than a player would just making bets by themselves. How do I place a Syndicate bet? Select your chosen lottery and then click on the ‘Syndicates’ tab. Select the syndicate size you wish to place your bet on. Choose how many shares you want. The lines are the amount of lines that you will be betting on in this syndicate. In the case above, 168 lines — or 168 lotto bets — in total will be placed on the next jackpot draw. If any of these numbers result in winning a prize, then the prize money is paid out to you in accordance to the numbers of shares you bought. The shares are the amount of shares that are available for this syndicate bet. IN the example in the image, 100 shares are available. You can purchase 1, 2 or 5 shares in total for this syndicate. If you buy 1 share of the possible 100, then you will receive 1/100th of the prize and so on. So, if you select 1 share for a lottery with a jackpot of £100m and one of the lines in the syndicate won the jackpot, you would receive £1 million. If you selected 2 shares you would receive £2m and if you selected 5 shares you would receive £5m. There is also additional information about the syndicate, for example, in the case above, the 168 lines will be placed on the next draw and there is no automatic renewal. How can I see my syndicate numbers? When you place your syndicate bet, you can see your numbers by going to “My Account” in the top right hand corner, clicking on “My Acivity” and then clicking on “My Syndicates”. You will see a bet slip with a combination of numbers. These combination of numbers make up the total amount of lines that you have bought in your syndicate. These are the numbers that you use to check if you have won anything in the lottery draw. 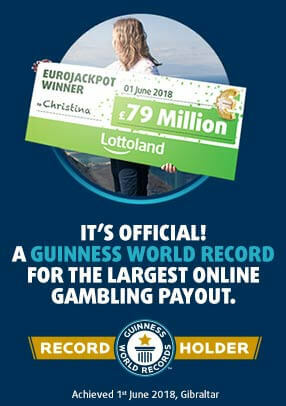 You will also be emailed your lotto syndicate numbers via a confirmation email.